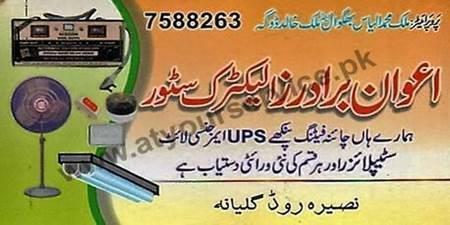 Awan Brothers Electric Store sells all kind of electrical spare parts. Electrician services in Gulyan Kharian is also available. Awan Brothers Electric Store is located on Naseera Road, Gulyana, Kharian. It deals in china fitting, electric fans, UPS, emergency lights, stabilizers and all other electrical spare parts. Electrician services in Gulyan Kharian is also available.